The National Carbon Cocky Awards are open to all Landholders and others in Australia achieving excellence in Carbon Farming techniques, regenerative agriculture, emissions reduction, carbon trade and associated services. The National Carbon Cocky Awards are open to all landholders and others in Australia achieving excellence in Carbon Farming and Emissions Reduction techniques which deliver improved soil carbon sequestration and water management OR who have developed innovative techniques OR inventions to improve farm based carbon storage OR emissions reduction. 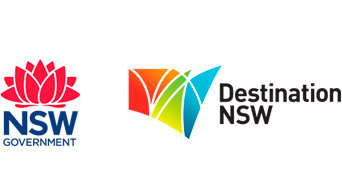 This Award is presented to the primary producer or landholder who has demonstrated overall excellence in understanding, implementing and achieving outstanding results in the management of land based carbon storage and/or carbon emission reductions. The winners of the additional four Awards are selected from the total pool of applications received. One Complimentary ticket for each finalist attending the National Carbon Cocky Awards Gala Dinner. In ADDITION — every FINALIST will be given an opportunity to provide a logo and up to 150 words description to promote themselves, their Business or Organisation on the Carbon Farmers Central Hub. Post event this information will be promoted on the Carbon Farmers of Australia website and will be linked back to the Finalist’s website, if applicable. Complete the Application Form below OR nominate another Landholder by completing the Nomination Form. 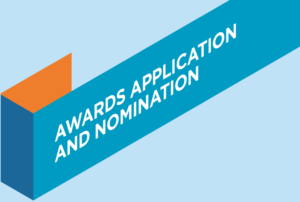 Applicants may choose to nominate themselves or their Nominee in all or any of the 12 Award Categories. For assistance in completing your Application or Nomination form, please call Jan on 0429 821 425. All submissions by landholders or businesses must demonstrate how they have met the judging criteria, or are working towards meeting the criteria. Please keep submissions clear and concise. To be eligible you do not have to fulfil every criterion — these are listed as a guide. All nominations are welcome. A Carbon Farmers of Australia (CFA) representative will contact you regarding your application/nomination. Your submission is then forwarded to an independent expert panel for assessment. Submissions are assessed against a standard set of criteria to determine the potential to deliver improved soil carbon, water management OR creativity in developing innovative techniques or inventions to improve farm based sequestration or emissions reduction OR assess the positive outcomes achieved as a result of the support and product delivered to landholders. The judges choose up to 5 Finalists for the 12 Awards with selection criteria. 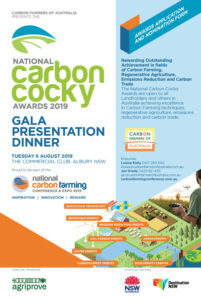 All Finalists are invited to attend the National Carbon Cocky Gala Awards Dinner held on Tuesday 6 August 2019 in Albury — the social event of the Carbon Farming Conference & Expo. Finalists of each Award are presented with a Certificate on stage, and the Winner of each Award is announced and presented with a personalised trophy and product and/or services Gift Voucher courtesy of the Award Sponsor. This form is for YOU YOURSELF to apply for the Award/s. This form is TO NOMINATE SOMEONE ELSE for the Award/s. You can download the a copy, print it and email your submission.